Part poem, part lullaby, this gentle story celebrates a baby's wonder at our beautiful world. From much-loved Australian Children's Laureate Alison Lester comes a timeless book to share and to treasure. Australian Children's Laureate Alison Lester is one of Australia's most popular and bestselling creators of children's books. She has won many awards, including the 2005 Children's Book Council of Australia (CBCA) Picture Book of the Year Award for Are We There Yet? and the 2012 CBCA Eve Pownall Book of the Year Award for One Small Island. 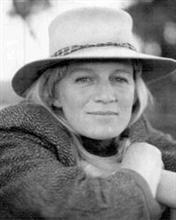 Her most recent picture books include Running With the Horses, a story based on the evacuation of the world-famous Lipizzaner horses from the Spanish Riding School in Vienna during the second world war; One Small Island, about the life and times of a World Heritage Listed island; and Sophie Scott Goes South about a little girl's voyage to Antarctica. Alison lives on a farm in the Victorian countryside. She spends part of each year travelling to schools around Australia, helping students and teachers develop their own stories. Best first book for a new born (actually the parents). This is so beautiful, poetic and perfect gift for the parent to read to the baby. This book is a love letter to your little one. I'm giving this as a gift to my son when he turns one. He might not understand the words much now but as he grows up with it, he'll appreciate it more and more. I'll be writing a letter in it too. I buy this book as a gift for newborns and young children. Is a lovely book for parents to read to their children. A beautiful book. A particularly lovely bed time story and great for babies and young children. Reads like a lullaby and poetry. Beautiful illustrations. This is a beautiful gift for a baby - it is like a lovely prayer for them. This is a beautiful book with lovely illustrations. It has a peaceful, gentle pace to it and is a very suitable as a gift to a new baby as it describes all the things you hope that a child is going to experience. Also suitable for all little ones 0-3 years old. Perfect for a new baby gift. Beautiful illustrations by Alison Lester reflect the sentiments so simply put about the wonders of nature. Beautiful book, always brings a tear to the eye! Alison Lester is one of Australia's most popular and bestselling creators of children's books. She has won many awards, including the 2005 Children's Book Council of Australia (CBCA) Picture Book of the Year Award for Are We There Yet? and the 2012 CBCA Eve Pownall Book of the Year Award for One Small Island. Her picture books include Running With the Horses, a story based on the evacuation of the world-famous Lipizzaner horses from the Spanish Riding School in Vienna during World War Two; One Small Island, about the possibility of hope and environmental preservation for a World Heritage listed island and for the world itself; Sophie Scott Goes South about a little girl's voyage to Antarctica and the sense of wonder that it brings; and Kissed by the Moon, a lyrical celebration of the natural world and all that it has to offer a child.